There appears to be a bug within the Presto app which causes fare gates to crash, after Android users try to reload their tap cards. According to CBC News, Robert Leyzerovich discovered the bug when he was testing the Presto app’s card reload functionality on his Samsung smartphone. He claims he encountered a series of errors while testing the loading function on the app. When he later went to tap his card at a subway station, he said the screens on the gates turned black, and that the same thing happened when he took his card to a fare loading machine. Leyzerovich shared a handful of videos on YouTube, showing how his malfunctioning Presto card—which was assumed to be reloaded via the Presto app—was causing fare gates to malfunction, along with loading machine screens. “They had to completely restart the system,” said Leyzerovich, who says he told the TTC and Presto about his findings afterwards. During the system restart, tap fares cannot be collected, therefore forcing the TTC to let in all passengers without paying, riding transit for free. According to the TTC, malfunctioning Metrolinx hardware caused $3.4 million in losses in 2018. You can watch Leyzerovich’s videos below, showing how his Presto card disables tap fares at the gates and also causes a fare machine’s display to go black. Have you encountered any errors with the Presto app and reloading your card on Android? iOS Presto app users do not get the NFC tap to reload feature, as Apple has not made NFC available to third-party developers. 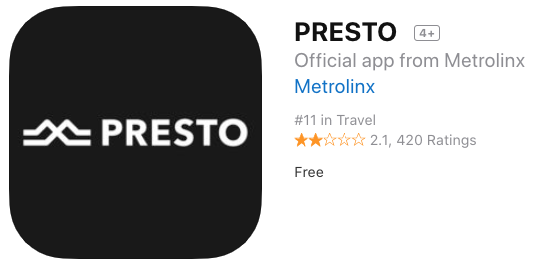 The Presto app launched for iOS and Android back in January, after a beta test phase.